The air leaves the Compressor and enters the Environmental (EV) Combustion Chamber (1), where 50% of the total fuel (natural gas) is added. 30 burners are used within the EV section to burn fuel in that chamber. These cut out chambers used for burning are annular shaped (they are the same shape as doughnuts). The resultant heated gasses exit the 30 EV burners and pass through the high pressure (HP) turbine. Work is done by the gases while they pass through the HP turbine and about half of the pressure is used in the process. But the unused pressure is not lost in this case as there is a second stage of combustion. After exiting the HP turbine more fuel is added. This addition happens in the Sequential Environmental (SEV) Combustion Chamber (2). In the SEV the air is reheated by 24 annular burners, housed in the secondary Combustion Chamber and the resultant expanding gases are used to drive four Low Pressure (LP) turbines (3). Note the HP and the four LP turbines all run along the same axis. Concentric shafts are housed within each other. The reheat and LP turbines greatly reduce the NOx emissions in Aghada. 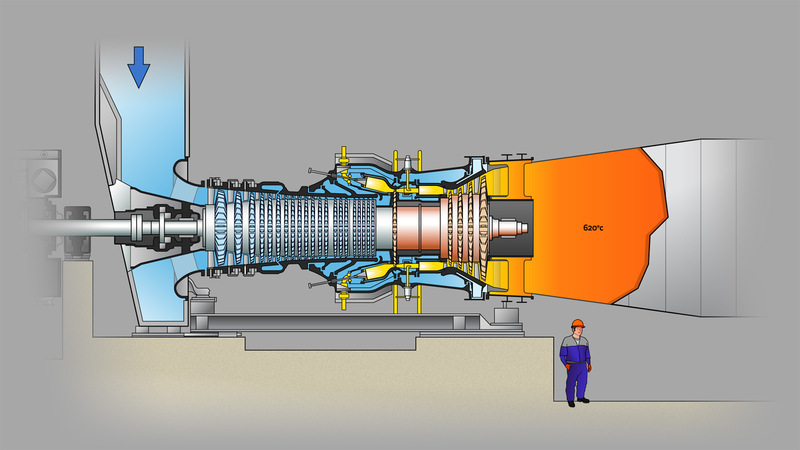 They are permanently coupled to the rotor in the Generator and the transfer of kinetic energy establishes a magnetic flux in the Generator while the Gas Turbine shaft is rotating.